This Student Book supports the new BTEC First Award in Application of Science. The first external assessment for this award will take place in March 2014, although the award can be taught from 2012. Resources designed to support learners of the new next generation BTEC First in Applied Science: Application of Science specification*. 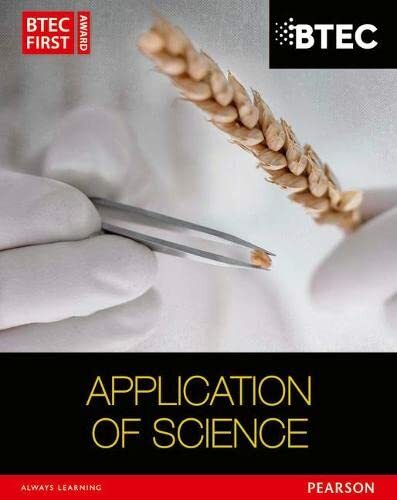 This book supports BTEC First Award in Applied Science - Application of Science QCF specification for first teaching from September 2013 (subject to accreditation by Ofqual). This book contains new content for the 2012 specification covering the mandatory four units with in depth knowledge, case studies, examples and activities to help learners prepare for this course. Combining the expertise of the BTEC team, the content addresses a learning, teaching and assessment point of view, with renewed focus on assessment activities including the new external assessment. Activities in each unit provide support and guidance for learners and can be used in the classroom or for independent work. The new BTEC Assessment Zone guides learners through the challenges of both internal (units 5-7) and external assessment (unit 8) with examiner tips and support for external assessment. * From 2012, Pearson's BTEC First qualifications have been under re-development, so schools and colleges could be teaching the existing 2010 specification or the new next generation 2012-2013 specification. There are different Student Books to support each specification. If learners are unsure, they should check with their teacher or tutor.